Only 112 days until the tATu movie is released. I posted a preview from it on the FMU blog yesterday. It looks quite promising. Whah? there is a movie?? You are getting sleepy. You are getting very sleepy. You are going to your checkbook and sending WFMU a boatload of your money . . .
Hahaha. A read, live, staged, pre-taped, fictional perfomance. Can the t.a.t.u movie be works than "You Can't Stop The Music"? Or "Kiss Meets The Phantom Of The Park"? Leave off Xanadu, the soundtrack is fantastic! Streisand's "Star is Born". And though I know people disagree, I hated Ken Russel's "Tommy." such pretty music. so 80's sounding...camera obscura...more please of this jangly brit pop. i'm getting married in februari, does anybody know a song that we can play at the ceremony? Dieuwke, may I suggest 'Night and Day'? Wedding music: Not Gonna Get Us by t.a.T.u., of course! That is a fantastic movie! I just revisited it with my 10 yr old daughter. The film stock, the cinematography, some of the music, Kevin Bacon's hair, John Lithgow's acting. Though the dialogue is not great there is no fat, it is quick and tight like a pulp western. Lori Singer need to eat a sandwich though. I do lament that Sarah Jessica Parker went on to such fame. Don't dis Footloose. Worst rock & roll movie: Ladies and Gentlemen, the Fabulous Stains. what about Spice World? It's worth watching for the cameos alone. dieuwke : I wanted the theme from Phantom of the Opera (tocotta & fugue in D minor I think), but in the mad rush to clean house before the ceremony, it got lost. So instead, bride dei entered to Kronos Quartet's Early Music. I liked the De Artsen that was really cool. Keep up the cool jams. Song Remains the Same, The Wall, and lest we forget, the Tom Petty movie Bogdanovich just did--like we need 3 hours of that mediocrity? Krikey. The Spice Girls Movie gets my vote. worst rock films: "purple rain", "rock star"
What about Saving Private Ryan? The Spice Girls movie - I have never seen it and it's the worst movie I've never seen. Worst rock movie nomination: "FM"
Wow, Irwin - you're right. FM really is up there. Truly, truly awful. I thought Saving Private Ryan was good, except for the part about World War Two. I could maybe go with "Purple Rain"-Great music terrible move. But "FM"? that inspired "WKRP" and has one of the great covers for dead air of all time.."...a track from the best of Marcel Marceau"
just listened to the kronos quartet, it's nice but i'm looking for happy music. thanks for the suggestion. Moulin Rouge needs to be added to the worst movie list. Sheer torture. I sat through it only because someone I had a crush on thought it was the best movie. Argh! Worst Rock and Roll movie? The Apple. my co-worker who is also not supposed to be listening to music at work agrees with Vivian re: Moulin Rouge, though I disagree for reasons to visceral to express. Irwin is right about FM. I've been watching a lot of rock doumentaries lately and I gotta say there's a whole bunch of bad rock docs too - many without any context or even a reason to be made for that matter. One of the worst I saw was something they used to play on Channel 13 eons ago "Music from Big Sur" I think it was called. Ugh. definately, Head is great. Even if you're sober. And in the "best" direction, allow me to add An American Astronaut. It's not about rock, but it is a movie length music video so it almost counts. Plus it would pair quite well with Head as a double feature. What did you think of "Dig?" I saw Dig - it was interesting. Around the same time I watched "Mayor of Sunset Strip" about Rodney Bingenheimer and I'd recommend that as well. Also on the good side, although it was just videos, Urgh! A Music War is really cool. I have to agree, Detroit Rock City was pretty awful! You're Gonna Miss Me, the Roky Erickson doc is a great, great film that put me in 13th Floor Elevators mode for weeks. Definitely recommend it. Wow. I haven't heard any Scamp titles in a while. Nice. can anyone else chime in on the atrocity of "Almost Famous" and the mischarecterization of Lester Bangs please? Life's too short to seek out popular movies that other FMU listers have dissed. Yes, almost as bad as "Sid and Nancy"
I liked Urrgh too, and also the Daniel Johnston and Danielson Familie docums. I actually thought that Almost Famous had a few redeeming things about it, including Philip Seymour Hoffman's portrayal of Bangs. And then there was the great Peter Frampton poker scene. In fact; "Almost Famous" may be my only Phillip Seymout Hoffman disappointment. Gotta love a pope who sounds like Bela Lugosi! In fact it gives you a whole different way to think about his "resurrection." But Dave - Think about how much worse it could've been if they had picked someone other than Hoffman to play Bangs. It could've been like Hayden Christenson playing a buff and chiseled Bob Dylan in Factory Girl. Another reason not to see Factory Girl! Best rock movie: 200 MOTELS!!! Actually, Sienna Miller was a good Edie in Factory Girl, but almost everything else in the film stunk. Although I've heard that the director's cut is way improved. 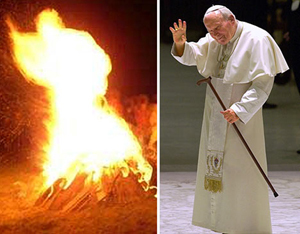 That Pope in the Fire picture is very convincing. I believe! OH NO - Wohin ist mein Wurst gegangen. My sausage has gone AGAIN!!! die wurst, demnaechst als Hit auf der Soester Kirmes! Hier bist seine Wurst... (naughty innuendos weren't covered in high school german). Now I habe durst for german rap. Jiffy Pope, Jiffy Pope -- the magic sight! When the faithwood gets wet, he's damn hard to light! Andy Moore rules. one of the most distinctive guitar sounds around now. Is this last comment a complicated multi-layered self parody joke? I mean has FMU really been on air since the 60s? I can't believe it. Bryan - The answer is Yes - if any particular religious leader claims that their (dead) leader has been manifested in a taco or a fire, I will report it. My promise to you. The Pope in the Fire was reported by none other than the Vatican News Service. but.... it's not the pope on fire..... it's not a burning pope..... errr it's not an ignited pope..... it's the appearance of the pope as fire. in much the same way as jesus appears in clouds and such like.